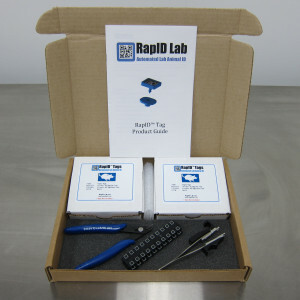 The RapID Lab Animal ID Starter Kit contains everything needed to start efficiently tagging mice. The starter kit comes bundled with three essential components. It includes 200 ID tags (which come in groups of ten), the applicator tool, the removal tool and a best practices guide on how to best introduce RapID Tags® to the facility, and making certain that the staff is well trained in its use before proceeding. There is always some trepidation when introducing a new product to staff, so RapID Lab has prepared a guide that comes along with the starter kit with instructions on how to best introduce the new animal identification tags to the team. Resident Experts. Have one or two staff members designated to become the resident experts. These staff members will learn how to best use RapID Tags and will be able to teach the procedure to the rest of the team. The ideal candidates will be technicians or investigators who show exemplary skill. They will have extensive experience with lab mice, strong hand‐eye coordination, excellent manual dexterity, and previous ear tagging experience. Mice must be housed no more than 5 mice to a cage. Mice should ideally be housed together for at least 7 days to acclimate and establish a social hierarchy within the cage before tagging. This will minimize the possibility of the animals fighting and damaging the tags. To prevent the mice from tearing the tags out accidentally, metal and plastic enrichments should be minimized or eliminated from rodent housing. Users should envision and brainstorm ways that RapID Tags can save time and reduce errors. Practice identifying and scanning animals using the scanner several times per week. Now that in-house experts have been established and trained, they can begin to train the remaining laboratory staff on how to use RapID Tags. To ensure that users know the proper methods, they should train using the Self Certification material that comes with the lab animal identification starter kit. The Self Certification guide instructs users on how to handle the ear tags, load the applicator, tag the animals, and remove the tags when necessary. Users should practice using the rodent tags with the provided simulated ears first. Once they are confident in their skills, proceed to using the applicator and remover on live mice. Watch for errors in technique, and correct them swiftly to ensure that the lab animals are treated humanely. Once these steps have been completed, a full staff will be ready to use RapID Tags efficiently and to the full extent of their ability. Click here to order the RapID Tags lab animal identification starter kit.